It is always great to have a quick recipe in your back pocket (or rather, pantry), and this is one of my favorites for the ‘chili’ parts of the year. It is super simple, and you can modify it to suit your family. 1 pound of Protein (We usually use the ground turkey from Aldi, but ground beef is fine, shredded chicken, or if you have a vegetable substitute, that will work. You can leave this part out entirely for a bean only chili. 1 large can crushed tomatoes (or two regular cans) – buy whatever is on sale, additions such as onions or Italian seasonings are fine. 1 large can Chili Beans (or again, two regular cans) – I greatly prefer Mrs. Grimes brand, and watch for sales to stock up. That brand also has a HUGE can, and I like to use that when I can get it, because it stretches the meat and meal further and I get leftovers for lunch. Extras – Chili Powder, salt, cheese, onions, peppers, etc. That’s it! Simply brown your meat and drain, add the tomatoes, add the chili beans with sauce, and heat through. If you want to be fancy, you can dice an onion to brown with your meat, or you can add dried minced onions. If you like peppers, toss ’em in. You don’t have to cook this a long time as the beans have already absorbed the chili sauce. Serve with cheese or other toppings. The sunbeams and I are happy with the level of spice in the chili beans, but Ray likes it a bit spicier so I set the chili powder out for him. We’ve also been happy with the level of salt in the Mrs. Grimes, but you can adjust this to your taste. Have fun with this basic recipe and make it yours! 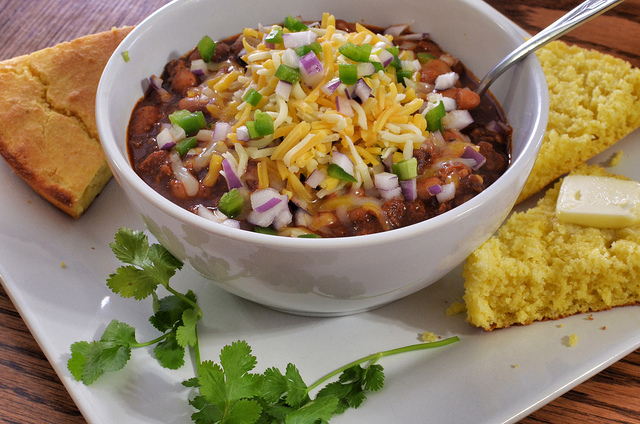 This entry was posted in Recipes and tagged chili, quick meal. Bookmark the permalink.